Memberships are billed on the first day of the shipment month. Members receive eight (8) shipments per year; please see our website for more details about the pick-up and shipping schedule. UPS will attempt to deliver packages containing alcohol three (3) times before sending it back to Ponte Winery. If a package returns, please contact the Wine Club directly at (951) 252-1780. A re-shipping fee will be applied to all orders that are re-shipped. For more on our shipping policy, please click here. You may cancel your membership after you have purchased two (2) bottles to activate your membership and received two (2) automatic Wine Club Shipments (6 bottles total). Memberships are billed on the first day of the shipment month. Any cancellations must be processed before the first to avoid being charged for the next shipment. Shipments processed prior to the cancellation are nonrefundable, even if not yet received. You may cancel your membership by calling the Wine Club directly at (951) 252-1780 or by emailing wineclub@pontewinery.com. We are committed to protecting your privacy. 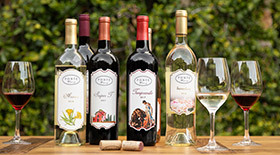 Your personal information will only be used by Ponte Winery and will not be sold or shared with anyone.